The University of Iowa is now an institutional member of QDR (Qualitative Data Repository) . The QDR membership gives faculty and other researchers a platform to store and share their qualitative data and enhances campus efforts for providing Research Data Services. “The main benefit of membership is curation and preservation of data projects deposited by affiliates – faculty, students, and research staff – of member institutions”. Most data repositories focus on quantitative data. QDR offers an advantage for curating qualitative data. Alternatives include having researchers manage data on their own, which would mean more time and expense. QDR is being funded at the University of Iowa by the University Libraries and the Iowa Social Science Research Center. The University of Iowa Libraries has been working closely with the Office of the Vice President of Research and Economic Development, Information Technology Services, and campus offices to support data management. Brett Cloyd (brett-cloyd@uiowa.edu | (319)335-5743) from the UI Libraries is the QDR Institutional Representative and serves as liaison with QDR. Please contact Brett with questions for help in getting started. More information is available at the UI Libraries’ QDR Guide. Funding for QDR is provided by the National Science Foundation, and hosted by the Center for Qualitative and Multi-Method Inquiry, a unit of the Maxwell School of Citizenship and Public Affairs at Syracuse University. 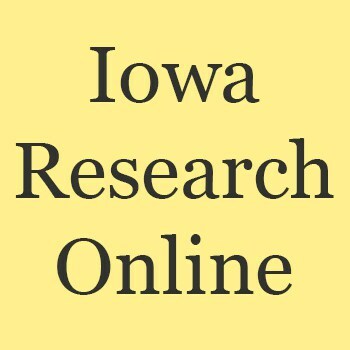 All theses and dissertations in Iowa Research Online have now been assigned DOIs. DOIs, or Digital Object Identifiers, are unique and persistent IDs for electronically published documents. DOIs will be used by publications citing your thesis/dissertation, so that there will be better information about where your work has been cited. Using a DOI also allows less formal usage to be tracked as well, such as tweets, links in Wikipedia, blog posts, etc. and will be included in alternative metrics (altmetrics). A DOI looks like this: 10.17077/etd.g638o927 and a DOI link looks like this: https://doi.org/10.17077/etd.g638o927. Clicking on the DOI link will take you to the current URL for the publication. URLs can change, but DOIs don’t. If the URL for your thesis or dissertation changes, due to a service migration or other updates, the DOI link will direct traffic to the correct URL. 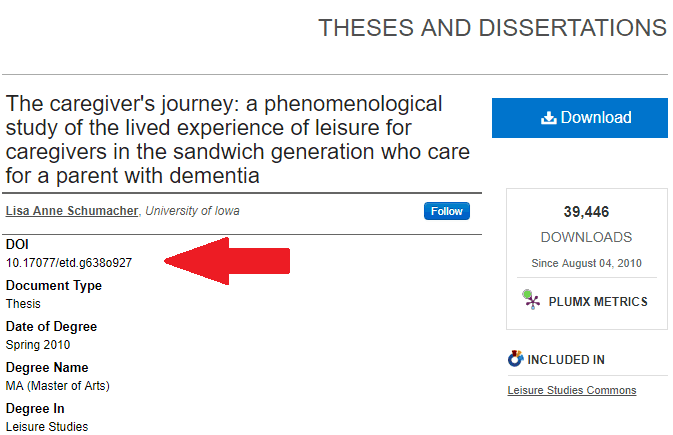 That’s why it’s important to include DOIs or DOI links in your citations, so your readers can follow your work back to the references you cited. To find the DOI for your thesis or dissertation, go to the IRO theses and dissertation series or your favorite search engine and search for your name and your thesis or dissertation title. Click on the title of your thesis or dissertation, and the DOI will be listed in the first field in the record. If you have any questions, or if you are not receiving monthly download counts and would like to, please contact lib-ir@uiowa.edu.